The usual way this ride is done is from south to north, starting at Kapoors Road on Highway 47, not far from Mount Ruapehu. From here there is a net descent of some 570 metres over 46 odd km's to Owhango. The track surface varies from gravel to mud, some stream crossings, and the inevitable uphills. The scenery is absolutely spectacular - from wide vistas of all three volcanoes to lush unspoiled bush. The track can be ridden just about the whole way, but it is in a very isolated area and, as the warning signs tell you, there is no easy way out. The signs also say that unfit riders should not attempt the ride and that you should take with you eye protection, tool kit, spare tube, map (Raurimu NZMS 260, S19), and warm waterproof clothing (not cotton). And do not forget a first aid kit. Of course, you also need enough food for maybe 6 hours and plenty of drink. Remember, if you get stuck here, you might have to wait some time for help. Perhaps overnight. Even an emergency thermal blanket would not go astray - it does not take up much room. There are a couple of places where a cell phone gets a signal. You need to look out for other track users which could include trampers, trail bikers, 4WD vehicles, horses, hunters, ATVs and, of course, other mountain bikers. Heading off along Kapoors Road you have a generally gentle downhill for about 6 km along an easy gravel road. Then you turn north on to Slab Road, which has its ups and downs, and which becomes more a 4WD track. There are one or two turn offs, so keep the map ready, although most of the time it is relatively obvious where you are going there are markers and you should check for these after each turnoff. There soon follows a great downhill to the Waione Stream. This is where the eye protection comes in handy as there are often nasty ends of branches sticking out ready to poke you. There are wicked little descents to some stream crossings, followed by equally wicked ascents on the other side. The track is variously sandy, clay, gravel and rock. There are several crossings of the river, and there is a very nice clearing near one of them (right at the foot of a steep descent) where you can have lunch. From river level there are some long climbs - see the gradient diagram - but the track is pretty well defined and you carry on to its end at the Whakapapa River Bridge. If you can get picked up here you have the joy of finishing on a downhill and it saves you the climb up to Owhango, but that possibly lessens the reward of a cold beer at the Owhango pub. 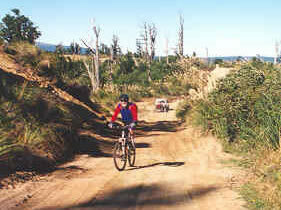 According to the book "Classic New Zealand Mountain Bike Rides" (ISBN 1-86956-011-6) this track is 34% gravel, 65% 4WD, and 1% unrideable and it is the best legal mountain bike adventure in the North Island. This is a unique track as you can either enjoy the magnificent beauty with your family on a more relaxed and peaceful outing or tear the knobs off your tyres with your friends.